Death Valley National Park, CA In between the very large sand dunes of Death Valley National park are these outstanding geometric formations. 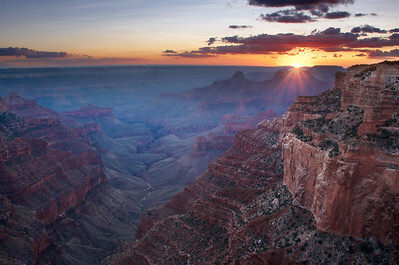 January in the park provides amazing sunsets like this. 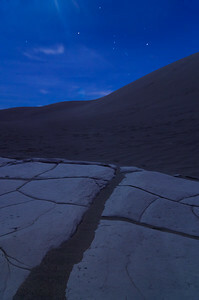 After shooting the stars it was a harrowing walk back to the parking lot through the maze-like sand dunes in the dark. 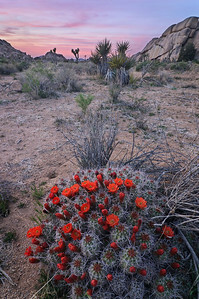 Joshua Tree National Park, CA After a decent rainy season, from the barren desert floor of Joshua Tree National Park often emerges a colorful blanket of wildflowers, including the blooming of the cactus plants. It is a beautiful, fleeting phenomenon that usually only lasts a couple of weeks in February. 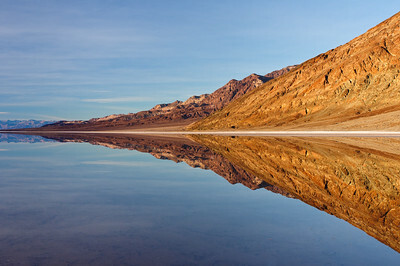 Death Valley National Park, CA During the winter Badwater, the lowest spot in the lower 48 states, floods, providing amazing reflections of the 11,000' mountain range above. 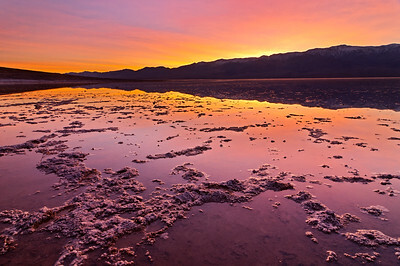 I hiked out into the flooded plains and plopped my tripod into the mud to take this image of a beautiful purple and pink sunset. 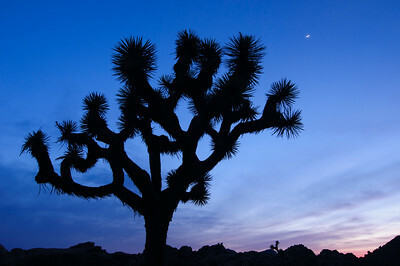 Joshua Tree National Park, CA A silhouetted Joshua Tree provides a beautiful contrast to the rising new moon above it. 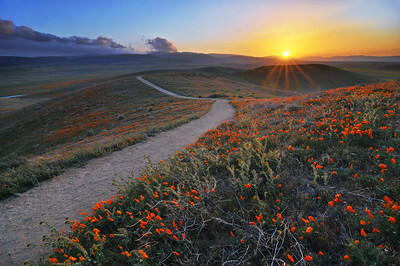 Antelope Valley Poppy Reserve, Lancaster, CA One of my first experiments with "sunstars", I took this image during a windy evening in the beautiful Antelope Valley Poppy Reserve, which glows with miles of orange poppies each spring. 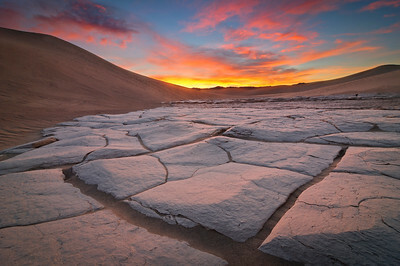 Death Valley National Park, CA Sunset glows above the Mesquite Sand Dunes of Death Valley National Park. 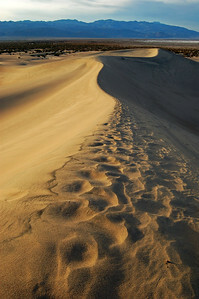 You can see the footprints of travelers hiking the giant and mysterious sand dunes. 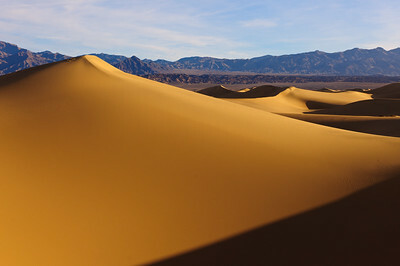 Death Valley National Park, CA Warm morning light paints the Mesquite Sand Dunes orange in Death Valley National Park. 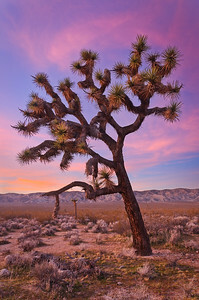 Mohave Desert, CA A large Joshua Tree grows patiently in the high plains of the Mohave Desert, near the junction of Highway 14 and Interstate 395. 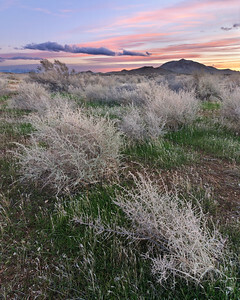 Mohave Desert, CA After winter storms, small green grass grows amongst the dried shrubs of the Mohave desert, framed underneath a lovely sunset sky. 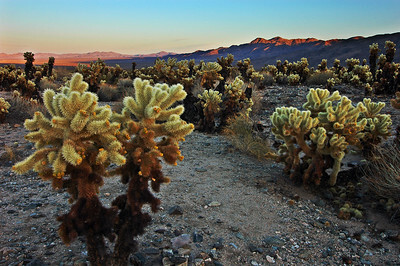 Joshua Tree National Park, CA These unique and beautiful "jumping cholla" cactus abound in sections of Joshua Tree National Park, as the last light hits the distant mountains on a crisp winter evening. 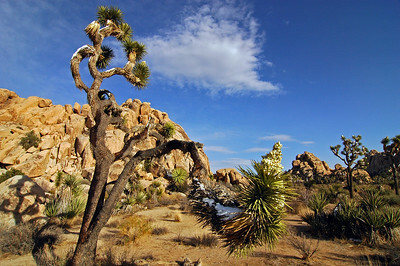 Joshua Tree National Park, CA A rare snow melts the morning light on a towering Joshua Tree. 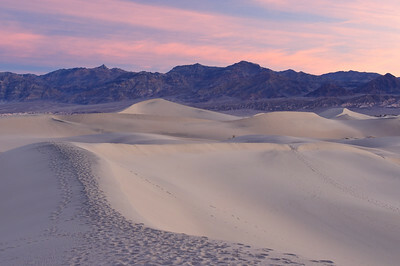 Snow in this desert park is rare but provides a unique, and surreal, view of the desert. Grand Canyon National Park, AZ A tiny tree grows through the rocky crags at the North rim of the Grand Canyon. 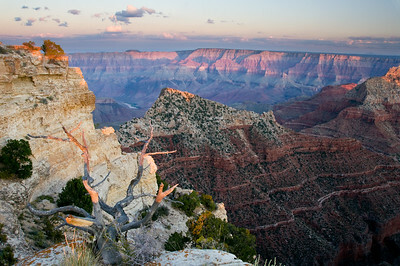 The lesser traveled North Rim provides visitors with a more rugged experience and beautiful light hitting the South Rim across the canyon. 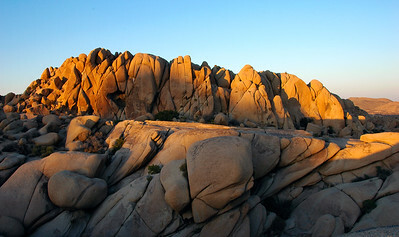 Joshua Tree National Park, CA Warm sunset light hits the giant boulders of the appropriately named Jumbo Rocks campground in Joshua Tree National Park, my favorite place to camp, featuring many amazing rock climbing opportunities. 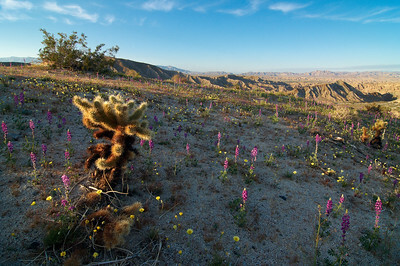 Anza Borrego Desert State Park, CA In February, especially after a wet winter, the desert floor of Anza Borrego lights up in a colorful display of wildflowers amidst the shrubs and cactuses. 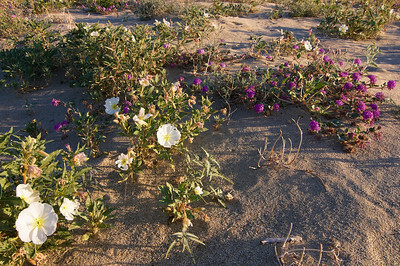 Anza Borrego Desert State Park, CA White and purple desert wildflowers bloom in a sand dune during the brief Anza Borrego springtime. 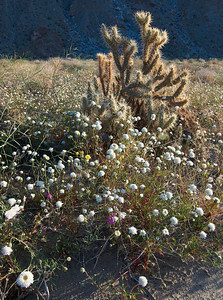 Anza Borrego Desert State Park, CA Wild lupine and tiny yellow flowers bloom among the "jumping cholla" cactus of Anza Borrego. 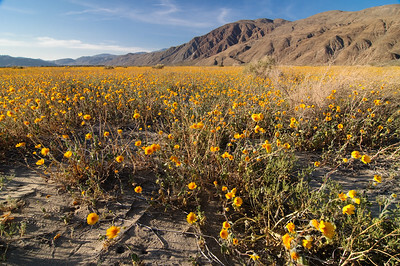 Anza Borrego Desert State Park, CA After a wet winter, the valley of Anza Borrego is aglow with miles of desert wildflowers. 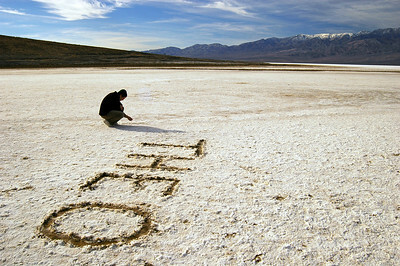 Death Valley National Park, CA The vandal "Theo" leaves his mark in the salt flats of Death Valley, which often make one feel small and insignificant when they go on for miles and miles. Death Valley National Park, CA Warm light hits the sand dune as I look back upon my footsteps during a winter afternoon in Death Valley. 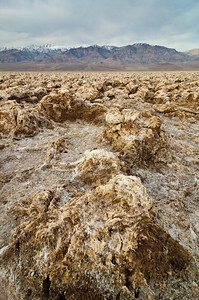 Death Valley National Park, CA One of the many unique geologic features of Death Valley, the "Devil's Golf Course" features miles of unique little mud mountains. 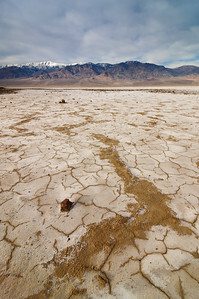 Death Valley National Park, CA The Orion constellation shines brightly over the mud flats between the Mesquite Sand Dunes in Death Valley National Park. 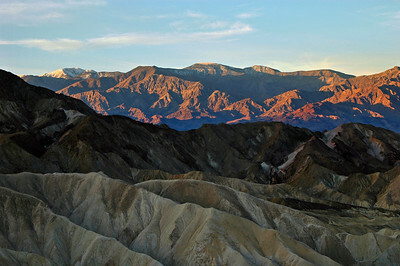 Death Valley National Park, CA At over 11,000' in elevation, Telescope Peak provides an interesting contrast rising over the desert floor and geologic hills of Zabriskie Point, featured in the foreground of this image. 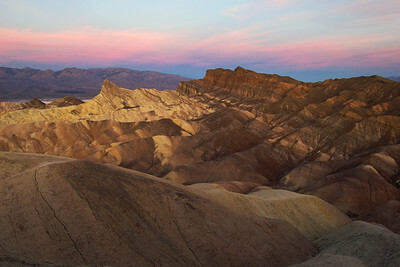 Death Valley National Park, CA Zabriskie Point provides a unique and beautiful series of hills with an interesting blend of geology, framed here below the pink glow of sunrise. 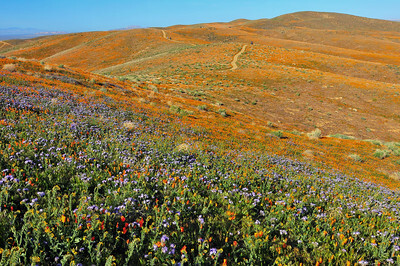 Antelope Valley Poppy Reserve, Lancaster, CA In April, miles of poppies bloom in the Antelope Valley Poppy Reserve as hikers walk the dirt trails (hopefully loaded up on Claritin!). 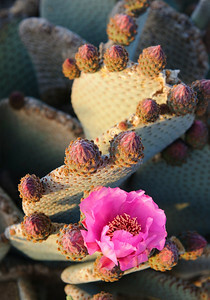 Joshua Tree National Park, CA In spring the cactus plants of Joshua Tree bloom with bright pink flowers, some even fruiting with delicious juicy fruit (at least to the desert mice and birds who eat them). 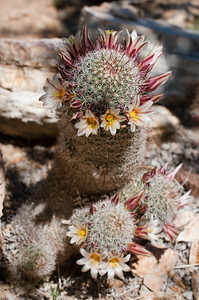 Anza Borrego Desert State Park, CA A tiny cactus blooms with white and yellow flowers during the spring in Anza Borrego state park. 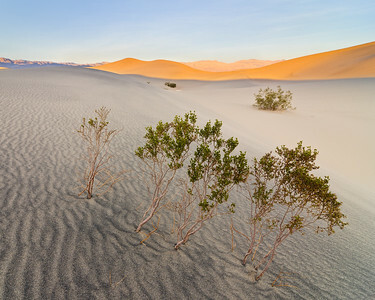 Death Valley National Park, CA Three desert shrubs grow in the middle of a sand dune in Death Valley National Park. This image to me represents the resilience of life, which can flourish in the most unexpected of places. Every December I travel to Mammoth Lakes to spend Christmas with family friends. 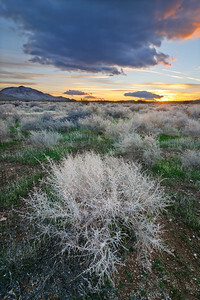 The drive back through the Mohave desert always provides some incredible light over the unique desert plants. 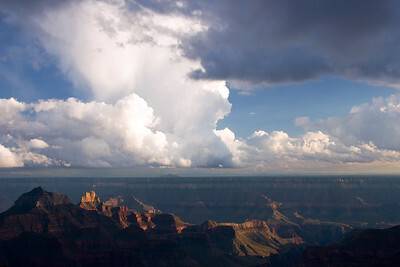 With this composition I chose to juxtapose the dry white shrub with the large storm cloud looming above.